The following is a brief summary of the March '09 tour of Papua New Guinea by the Indigenous Boomerangs side. The match in the capital, Port Moresby, was the Under 18 PNG Kupundas triumphant by one point, 9.12 (66) to 9.11 (65) at the University of PNG track oval. Of just as much interest was the excellent turnout of around 2000 to 2500 spectators (different sources). Best players for PNG: Kayne, Nicholas, Pena, Norman, Carbry and for the Flying Boomerangs: Ah Chee, McMasters, Crowe, Crook-Harrison, Wilson. A detailed review of the match was written in PNG's The National, by Peter Pusal - see Rules tourists get pipped by a point. Apparently the match finished with a thrilling last gasp goal - "The Boomerangs led 9.11 (65) to Kupundas 8.12 (60) with less than 30 seconds of play remaining in the match when Logo gathered the loose ball from a desperate surge up field and snapped a goal from 40m to grab an amazing win on the stroke of full-time". What was expected to be a more developmental PNG side (drawn mainly from Highlands and Momase) took to the field in the town of Lae for match two. With a game under their belt the Australian Aboriginal young men came out of their shells in a strong performance, winning 7.10 (52) to 2.2 (14). But excitingly a crowd of 7000 to 8000 turned out for the youth match, a great sign of interest in the game. 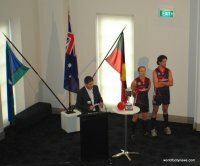 AFL Oceania's Andrew Cadzow summed up the two matches as "Huge crowds and magnificent football". 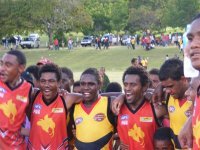 The PNG AFL then hosted a fundraising dinner at the Grand Palace restaurant after the match in which B Mobile announced a K300,000 sponsorship of AFL PNG’s junior programmes over the next three years. You can check out photos from the tour in our new media gallery (click on the image above or visit the gallery through the Multimedia menu at the top of this page - more photos from international footy to be added in the coming months).